Last time we had a look inside a marvelous piece of engineering machinery known as a crankshaft. It plays a key role in converting the reciprocating linear motion of a steam driven engine into the rotary motion required to power externally mounted devices that are attached to it. Today we’ll finish up our blog series on flywheels when we see how using one in conjunction with a crankshaft facilitates a more even transmission of energy. Reciprocating engines maximize efficiency when they employ flywheels. We learned that the energy in the steam supply decreases as the piston moves in its cylinder, which means a concurrent decrease in the engine’s horsepower and its ability to power machinery. Without an intervening action, the reciprocating steam engine would stall. Now, let’s see how adding a flywheel to the crankshaft can solve the problem. As we’ve learned before, a flywheel stores up kinetic energy while the engine powering it is performing at full horsepower, but if that power should drop off or cease to be produced, the flywheel gives up the kinetic energy stored inside it so as to keep externally mounted machinery operating until that stored energy is exhausted. This is all made possible because flywheels are designed to have moments of inertia sufficient to positively contribute to its storage of kinetic energy. This inertia is a numerical representation of the flywheel’s resistance to change in motion. Please review our past blog on the subject to refresh your memory. The overall effect is that while the engine is operating, there’s an even flow of energy between the engine and flywheel and horsepower is supplied to keep machinery mounted to the crankshaft operating. Any diminishment in the power supplied will be compensated for by the flywheel’s stored kinetic energy. Next time we’ll introduce a new topic, a phenomenon known as cavitation. Last time we developed an engineering formula to calculate the horsepower required to accelerate a flywheel by way of a reciprocating steam engine, which contributes to the storage of kinetic energy inside a flywheel. Today we’ll gain a clearer understanding of how this works when we take a look inside a reciprocating steam engine. A reciprocating steam engine performs the work of transforming steam’s heat energy into the mechanical energy needed to move a piston contained within a cylinder. During a complete operating cycle this piston travels from one end of the cylinder to the other, then back again. This is made possible because during the first half of the cycle pressurized steam enters one end of the cylinder and expands inside it, forcing the piston to move. 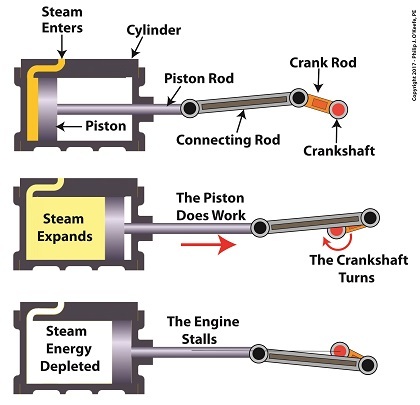 This process inside the cylinder results in movement of a piston that’s attached to a piston rod, which in turn is connected to a crankshaft via a connecting rod and crank rod. The crankshaft is a device which converts the reciprocating linear motion of an engine’s piston into rotary motion and in so doing facilitates the powering of any externally mounted rotating machinery attached to it. So long as there’s ample steam to power the internal piston, over time, energy in the form of horsepower will be available to externally mounted devices. The energy in the steam decreases as the steam expands behind the moving piston. So, the engine’s horsepower, will decrease as the piston travels to the end of the cylinder. If the energy in the steam should become depleted, the reciprocating steam engine will stall. The engine will no longer be able to perform work. Next time we’ll see how a crankshaft works when we take a look inside it. where, T is the torque created on the flywheel’s shaft in units of inch-pounds. The term n is the flywheel shaft’s speed of rotation in revolutions per minute, RPM. Horsepower, HP, is engineering shorthand for a unit of power equal to 6600 inch-pounds per second, and the number 63,025 is a constant needed to convert torque, T, and the spinning shaft’s rotations per minute, RPM, into horsepower units. 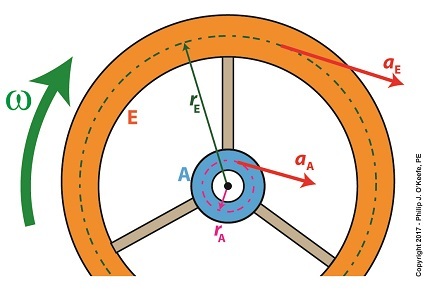 Torque is present whether the flywheel’s spin accelerates or decelerates. During acceleration torque is created, which contributes to the production of kinetic energy that’s stored inside the flywheel. When a flywheel’s spin decelerates, its mass experiences the effects of negative acceleration, and stored kinetic energy is released. As we learned awhile back, horsepower is a function of torque in any moving machinery, including engines and flywheels. An engine must produce horsepower to accelerate a flywheel connected to its shaft. By the same token, when the engine’s horsepower output diminishes or stops, the flywheel begins to decelerate. This deceleration causes kinetic energy stored within the flywheel to be released, providing horsepower necessary to keep the engine and flywheel spinning. That is, until the power output of the engine returns or the stored kinetic energy of the flywheel is ultimately exhausted. We’ll see how that works next time when we take a look inside a reciprocating engine. Last time we began our discussion on moment of inertia and how it affects a flywheel’s storage of kinetic energy. That inertia is a function of the flywheel’s mass, in particular how the mass is distributed. Today we’ll continue our discussion and see how an engineering principal known as torque affects things. We learned in a previous blog that torque is most simply defined as a measure of how much force acts upon an object to cause it to rotate around a pivot point or center of rotation, shown as a small black dot in the illustration. 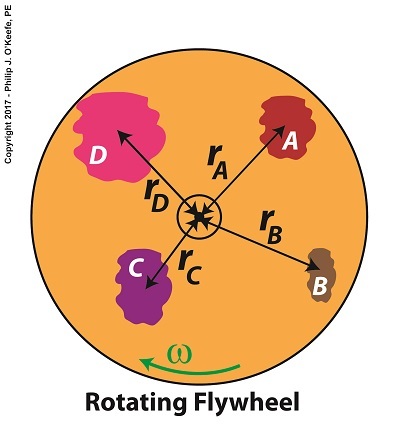 For our discussion we’ll focus on two parts of the flywheel, the hub, part A, and the rim, part E.
Part A has a mass mA located a distance rA from the flywheel’s center, while part E has a mass mE located a distance rE from it. 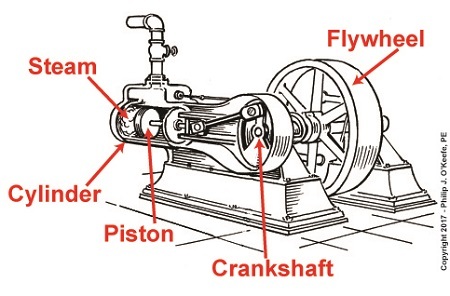 When an engine applies mechanical power to the flywheel by way of its rotating shaft, the revolutions per minute, RPM, increase and along with it the angular velocity, ω, also increases. For a refresher on this, follow the link. Part E’s greater mass will contribute more torque than part A, and it will also contribute more to the flywheel’s kinetic energy content. Most flywheels are designed with heavy rims supported by small hubs and slender spokes, because the more mass that’s distributed away from the flywheel’s center of rotation, the greater the flywheel’s moment of inertia and torque, and the more kinetic energy it can store. Next time we’ll develop an equation which allows us to quantify the horsepower required to accelerate a flywheel. How Much Kinetic Energy is Contained Within a Spinning Flywheel? 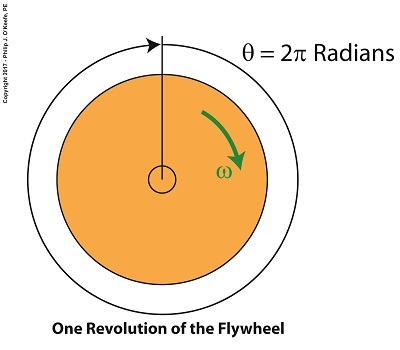 Last time we introduced the fact that spinning flywheels are subject to both linear and angular velocities, along with a formula that allows us to calculate these quantities for a single part of the flywheel, designated A. We also re-visited the kinetic energy formula. Today we’ll build upon those formulas as we attempt to answer the question, How much kinetic energy is contained within a spinning flywheel? 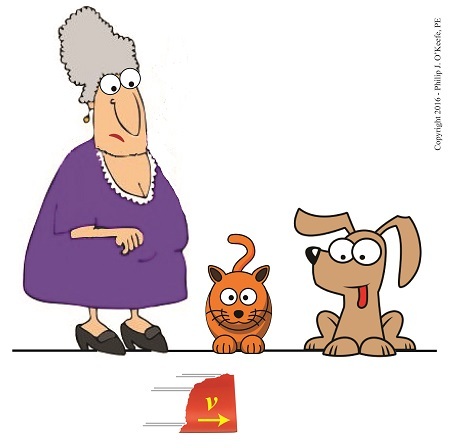 where, m equals a moving object’s mass and v is its linear velocity. Here again is the formula used to calculate linear and angular velocities for a single part A within the flywheel, where part A’s linear velocity is designated vA, angular velocity by ω, and where rA is the distance of part A from the flywheel’s center of rotation. Equation (4) is a great place to begin to calculate the amount of kinetic energy contained within a spinning flywheel, however it is just a beginning, because a flywheel contains many parts. Each of those parts has its own mass, m, and is a unique distance, r, from the flywheel’s center of rotation, and all these parts must be accounted for in order to arrive at a calculation for the total amount of kinetic energy contained within a spinning flywheel. Put another way, we must add together all the m × r2 terms for each and every part of the entire flywheel. How many parts are we speaking of? Well, that depends on the type of flywheel. We’ll discuss that in detail later, after we define a phenomenon that influences the kinetic energy of a flywheel known as the moment of inertia. Posted in Engineering and Science, Expert Witness, Forensic Engineering, Innovation and Intellectual Property, Personal Injury, Product Liability, Professional Malpractice | Comments Off on How Much Kinetic Energy is Contained Within a Spinning Flywheel? Anyone who has spun a potter’s wheel is appreciative of the smooth motion of the flywheel upon which they form their clay, for without it the bowl they’re forming would display irregularities such as unattractive bumps. The flywheel’s smooth action comes as a result of kinetic energy, the energy of motion, stored within it. We’ll take another step towards examining this phenomenon today when we take our first look at calculating this kinetic energy. To do so we’ll make reference to the two types of velocity associated with a spinning flywheel, angular velocity and linear velocity, both of which engineers must negotiate anytime they deal with rotating objects. where m is the moving object’s mass and v its linear velocity. 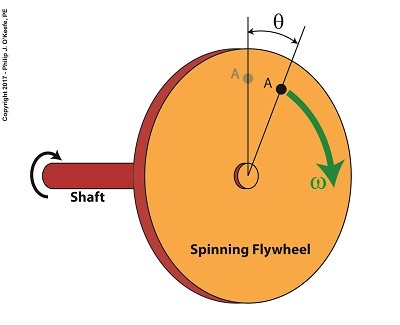 Flywheels rotate about a fixed point rather than move in a straight line, but determining the amount of kinetic energy stored within a spinning flywheel involves an examination of both its angular velocity and linear velocity. In fact, the amount of kinetic energy stored within it depends on how fast it rotates. For our example we’ll consider a spinning flywheel, which is basically a solid disc. For our illustrative purposes we’ll divide this disc into hypothetical parts, each having a mass m located a distance r from the flywheel’s center of rotation. We’ll select a single part to examine and call that A. Part A has a mass, mA, and is located a distance rA from the flywheel’s center of rotation. 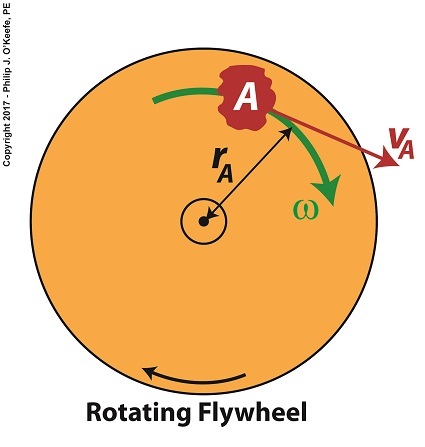 As the flywheel spins, part A rides along with it at an angular velocity, ω, following a circular path, shown in green. It also moves at a linear velocity, vA, shown in red. vA represents the linear velocity of part A measured at any point tangent to its circular path. This linear velocity would become evident if part A were to become disengaged from the flywheel and cast into the air, whereupon its trajectory would follow a straight line tangent to its circular path. Next time we’ll use this equation to modify the basic kinetic energy formula so that it’s placed into terms that relate to a flywheel’s angular velocity. This will allow us to define a phenomenon at play in the flywheel’s rotation, known as the moment of inertia. Last time we introduced angular velocity with regard to flywheels and how a fixed point riding piggyback on a moving flywheel travels the same circular path as its host at a pace that’s measured in units of degrees per second. Today we’ll introduce another unit of measure, the radian, and see how it’s uniquely used to measure angles of circular motion in units of radians per second. Back in elementary school we worked with protractors and measured angles in degrees, and we were all too familiar with the fact that the average protractor maxed out at 180, or half the degrees present in a complete circle. But in the grownup worlds of physics and engineering, angles of circular motion are measured in units called radians, an international standard equal to 57.3 degrees that’s used to measure objects rotating in circular motion. If we divide a circle’s value of 360 degrees by the 57.3 degrees that represent a radian, we find there are 6.28 radians in a circle, and oddly enough, it just so happens that 6.28 is equal to 2 × π. Anyone who stayed awake during math class can’t help but remember that π represents a constant value of 3.14, a number that pops up anytime you divide the circumference of a circle by its diameter. No matter the circle’s size, π will always result when you perform this operation. Applying these facts to radians, we find that during one complete revolution of a flywheel the measure of the angle θ increases from 0 radians to 2π radians. Next time we’ll see how angular velocity is used to determine the kinetic energy contained within a flywheel. We introduced the flywheel in our last blog and the fact that as long as it’s spinning it acts as a kinetic energy storage device. Today we’ll work our way towards an understanding of how this happens when we discuss angular velocity. Angular velocity is represented in engineering and physics by the symbol, ω, the Greek letter Omega. The term angular is used to denote physical quantities measured with respect to an angle, especially those quantities associated with rotation. To understand how angular velocity manifests let’s consider a fixed point on the face of a flywheel, represented in the illustration as A. When the flywheel is at rest, point A is in the 12 o’clock position, and as it spins A travels clockwise in a circular path. An angle, θ, is formed as A’s position follows along with the rotation of the flywheel. The angle increases in size as A travels further from its starting point. If A moves one complete revolution, θ will equal 360 degrees, or the total number of degrees present in a circle. As the flywheel spins through its first revolution into its second, point A travels past its point of origination, and in two complete revolutions it will travel 2 × 360, or 720 degrees, in three revolutions 3 × 360, or 1080 degrees, and so forth. The degrees A travels continue to increase with each revolution of the flywheel. Next time we’ll introduce a unit of measurement known as radians which is uniquely used to measuring the angles of circular motion. What Came First? The Wheel or the Flywheel? What came first? The wheel or the flywheel? Archeologists have been debating this question for decades. One thing is certain, they both date back to prehistoric times. One of the oldest flywheel discoveries was a potter’s wheel, used to make pottery. It’s a turntable made of stone or heavy wood that’s connected to a massive wheel by a spinning shaft. Once the potter got the flywheel spinning with his hand or foot, the wheel’s heavy weight kept it in virtual perpetual motion, allowing the potter to concentrate on forming the clay he shaped with his hands. A potter’s wheel, or any other flywheel for that matter, takes a lot of initial effort to put into motion. In other words, the potter must put a lot of his own muscles’ mechanical energy into the flywheel to get it moving. That’s because its sheer weight binds it to the Law of Inertia and makes it want to stay at rest. But once the flywheel is in motion, the potter’s mechanical energy input is transformed into kinetic energy, the energy of motion. The kinetic energy the potter produces by his efforts results in surplus energy stored within the flywheel. Hence, the flywheel serves as a kinetic energy storage device, similar to a battery which stores electrical energy. As long as the flywheel remains in motion, this stored energy will be used to keep the turntable spinning, which results in no additional mechanical energy needing to be exerted by the potter while forming pots. The flywheel’s stored energy also makes it hard to stop once it’s in motion. But eventually the frictional force between the potter’s hands and the clay he works drains off all stored kinetic energy. Since the Industrial Revolution flywheels have been used to store kinetic energy to satisfy energy demands and provide a continuous output of power, which increases mechanical efficiency. Next time we’ll begin our exploration into the science behind flywheels and see how they’re used in diverse engineering applications. Posted in Engineering and Science, Expert Witness, Forensic Engineering, Innovation and Intellectual Property, Personal Injury, Product Liability | Comments Off on What Came First? The Wheel or the Flywheel?